The PawSox took the lead for good in the third inning. After a sacrifice fly by Jackie Bradley, Jr. plated Jeremy Hazelbaker, Brock Holt ripped his second home run of the season, a solo shot that put Pawtucket up 2-1. Hazelbaker had two hits on the night and stole his team-leading 36th base. Despite a tough start from Henry Owens, Portland was able to hold on for a 4-2 win against the Trenton Thunder (NYY). Owens was wild, walking seven and throwing a wild pitch in three innings. In all, he allowed just two runs (one earned), but his line was helped by Pete Ruiz and Christian Vazquez. Owens allowed the first four batters to reach in the fourth, including a game-tying walk to the final batter he faced. Ruiz entered with the bases jammed, but Vazquez promptly picked off the runner at third. Ruiz struck out the next batter and induced a line out to end the inning. Ruiz was credited with the win for his 3 1/3 hitless innings, striking out three, while walking one. Randy Perez threw 2 2/3 shutout frames for his fifth save. Michael Almanzar went deep for the Sea Dogs, his 14th of the year. J.C. Linares was 2 for 4 with a walk, a run scored and an RBI. Derrik Gibson and Shannon Wilkerson added two hits apiece, while Travis Shaw reached base three times via base on balls. Garin Cecchini may be either streaking or slumping, depending on how you look at his line. He had his second straight 0-for-3 night and is only 3 of his last 15, but with a walk he reached base for the 37th consecutive contest. In a matchup against the first-place Myrtle Beach Pelicans (TEX), an 18- hit barrage helped Salem prevail 10-3 to move within a half-game of the division lead. Luis Diaz made his Salem debut after a very strong season with Low A Greenville. Diaz was solid, picking up the win by allowing three runs (two earned) on six hits in six innings. He walked and struck out two apiece. 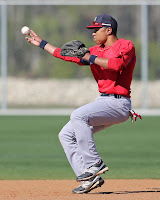 Diaz had a lot of offensive support, particularly from the red-hot Mookie Betts (pictured). The second baseman was 4 for 5 with a double, a run scored and a pair of RBI. Keury De La Cruz went 3 for 5 with a walk, two doubles, two runs scored, and three runs driven in. Blake Swihart and Henry Ramos had two doubles apiece for the Sox, and Stefan Welch added one as part of his three-hit performance. Salem remains three games up on Carolina for second-place in the Southern Division. In the event that first-half winner Myrtle Beach holds on for the division, the second place team would make the playoffs. It was another tough loss for Greenville, who fell 7-3 to the Rome Braves (ATL). The Drive had their chances, but were 2 for 13 with runners in scoring position. Francisco Taveras fell to 2-4, allowing five runs on seven hits in six innings. Mario Martinez led the offense, going 2 for 3 with a solo home run and a walk. Reed Gragnani added two hits. Lowell's 6-1 win over the Connecticut Tigers (DET) moved the Spinners within a game of first-place Tri-City. Manuel Margot has been on a roll since his return from injury and continued to streak on Thursday, going 3 for 5 with a double and two RBI. In five games since being activated, Margot is 9 for 23 with eight runs driven in. Carlos Asuaje doubled and drove in a pair as part of a two-hit night. Forrest Allday also collected two hits in the win. It was another solid outing for Jamie Callahan, who allowed a run on just two hits in five innings. He walked three and struck out five. It was Callahan's ninth consecutive appearance with three or fewer runs allowed, and he moved to 5-1 on the year. Jonathan Aro notched a save with four innings of shutout relief. Aro allowed only two hits and struck out three without walking a batter. With 13 games remaining, the win puts the Spinners just one game behind the Tri-City Valley Cats, who were rained out on Thursday. They remain in third place for the wild card hunt, 2.5 games behind State College. The GCL Red Sox opened up a two-game lead in their division with a 6-3 win over the GCL Rays. Top draft choice Trey Ball had his strongest outing to date, firing two scoreless frames, allowing three hits and striking out one without walking a batter. Willie Ethington returned from a three-week absence to earn the win, allowing two runs in his two innings of work. For the second time this week, the big hit came off the bat of a rehabbing Bryce Brentz. With the game knotted at two apiece, Brentz knocked a three-run, fifth-inning home run to put the Red Sox in the lead for good. Alixon Suarez also had a big night, going 3 for 4 with a pair of RBI. Wendell Rijo and Jordon Austin had two hits apiece. With six games to play, the GCL Sox' magic number is down to five. A day after clinching the Boca Chica Northwest Division, the DSL Red Sox are now playing for playoff seeding. They continued to help their cause with a 5-1 victory over the DSL Dodgers. Victor Acosta led the charge with a monster game at the plate, going 3 for 4 with a double and a home run, his eighth of the year. Acosta scored two and drove in two as part of the winning effort. The DSL Sox continue to receive phenomenal pitching, with a team ERA of 2.15. Thursday saw Javier Rodriguez take his turn in the dominant Red Sox rotation. He allowed four hits in five scoreless frames, striking out two without issuing a walk. Carlos Garcia threw two perfect innings of relief, striking out three. Player of the Day: Mookie Betts continues to roll. Jon Meoli profiled the 20-year-old second baseman yesterday, and his Thursday performance typified his dynamic first full season. Betts was 4 for 5, with a double on the night. After a bit of an adjustment period to the High A Carolina League in July, Betts has a fantastic .377/.455/.571 line in August.